Court Jew and financier; born in 1580; died at Jung-BuntzlauMay 2, 1634. He entered business early in life, ultimately became very wealthy, and stood in high favor with the emperors Rudolph II., Matthias, and Ferdinand II., to whom he, with other Jewish capitalists, frequently rendered financial assistance, particularly to Ferdinand, who needed large sums of money for the prosecution of the Thirty Years' war (1618-48). Bassevi, in recognition of his services, was raised to the nobility by Ferdinand, receiving the title "von Treuenberg," and a coat of arms consisting of a blue lion with eight red stars on a field of blue (according to Graetz; or of black, according to Lieben). Ferdinand also bestowed upon him the right "to engage in any business whatever, in any part of the empire, whether cities, towns, or market-places, in Prague and Vienna, and other places where Jews are allowed to reside or are not; to acquire property and to reside anywhere he pleases. His property in any form to be free from taxes, imposts, and duties; he is allowed to reside in the imperial quarters; and he is responsible to no tribunal, except that of the marshal of the court." Privileges were also granted to him by Rudolph and Matthias, all of them being hereditary. The supposition that he was minister of finance to Ferdinand is unfounded. 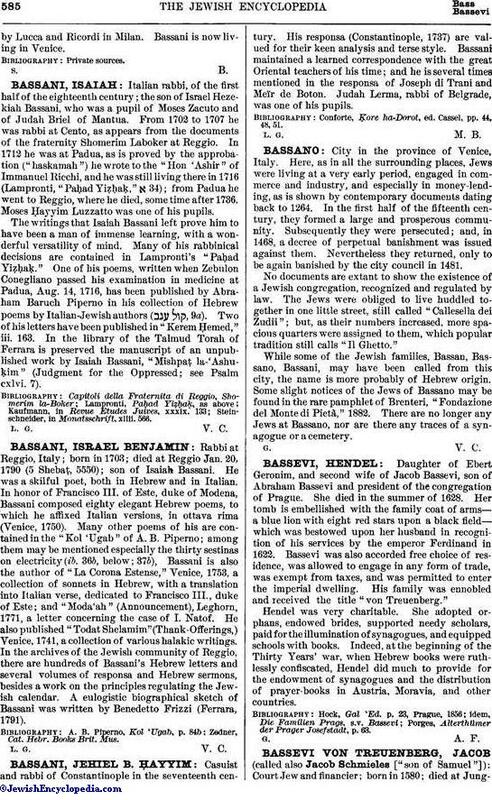 As a representative of the Jewish community, reference to Bassevi is first found in 1616. He always exerted his influence in behalf of the Jews of the empire and of Italy; and it was due to his efforts, combined with those of other Jewish capitalists, that the Hebrew quarter in Prague was protected by a military guard against the attacks of the soldiery after the decisive battle of White Mountain, Bohemia, in 1621. Bassevi was a warm friend of Rabbi Lippman Heller, and befriended him during the latter's arrest (July 5, 1629) and dismissal from office (Aug. 14, 1629); contributing from his own funds one-fifth of the fine of $12,000 imposed upon Heller. 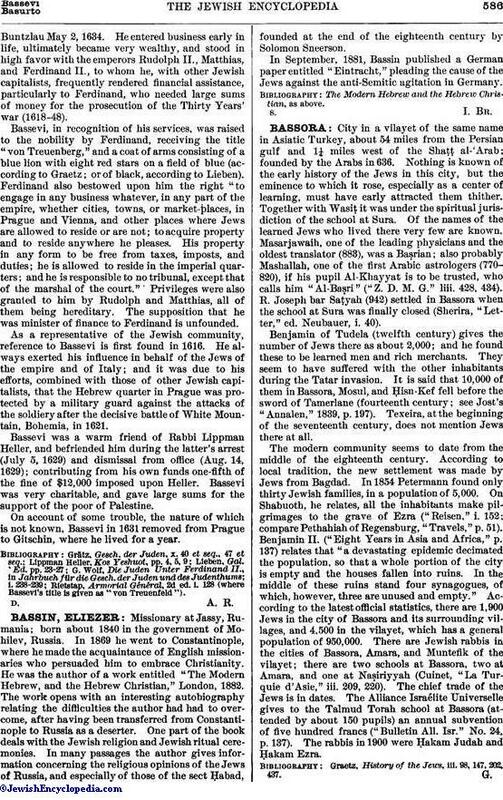 Bassevi was very charitable, and gave large sums for the support of the poor of Palestine. On account of some trouble, the nature of which is not known, Bassevi in 1631 removed from Prague to Gitschin, where he lived for a year. Rietstap, Armorial Général, 2d ed. i. 128 (where Bassevi's title is given as "von Treuenfeld").